Hassan Joho or Amason Kingi for presidency come 2022 to fulfil Ronald Ngala dream. - Bana Kenya News, Real African Network Tubanane. Home featured Mombasa Hassan Joho or Amason Kingi for presidency come 2022 to fulfil Ronald Ngala dream. Hassan Joho or Amason Kingi for presidency come 2022 to fulfil Ronald Ngala dream. 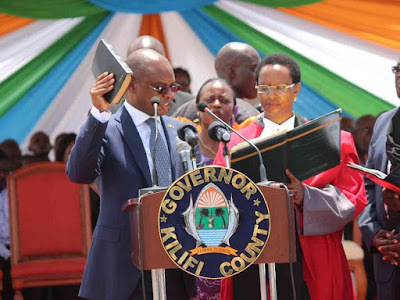 Kilifi incumbent Governor who won the seat for the second was officially sworn in for the second term in office today at Karisa Maitha stadium in Kilifi. According to him on his speech, Kingi declared that he will run for the presidency in 2022. He said “Although the late Ngala did not succeed in his efforts, today another chance for Coast is coming up. I am officially declaring that either I or my brother Hassan Joho will be on the presidential ballot in 2022." Kingi declared this at his swearing-in ceremony on Monday, saying he will discuss the matter with Joho, who has also shown interest. “After Joho is sworn-in, we will go for a retreat and the main discussion will be on who will go for the seat. From the retreat, we shall come out with one voice which we shall relay to the people of Kilifi and the Coast region as a whole." “What he has told you is exactly that. We are so close and because we all want to be in the same government in 2022, we shall do that. Kingi is more than a brother to me and we share a lot. Expect a declaration soon from us." The Governor and DG Gideon Saburi were sworn-in by Justice Margaret Mwangi and Kilifi senior resident magistrate Robinson Ondiek. All the seven MPs-elect from the constituency were present. Other guests were Mombasa Deputy Governor-elect Michael Kingi, Mvita MP Abdulswamad Nassir, Mishi Mboko (Likoni), Badi Twalib (Jomvu), and Omar Mwinyi (Changamwe). The duos have been fighting for the coastal people over high leadership oppression which include; land grabbing, port services relocation, equity etc. Mombasa governor Hassan Joho was sworn in yesterday and today was Kilifi governor.